At Trinity Buckingham Church, we worship God using liturgy from the Book of Common Prayer, celebrating Holy Communion at every service. Sundays (September 10 through June) — 8:00 a.m., 9:15 a.m. and 10:15 a.m., with Sunday School and Nursery Care offered during the 10:15 a.m. service. — The 8:00 a.m. service is a smaller, quiet service. — The 9:15 – 9:45 a.m. service is our new Children of All Ages Service, a service oriented particularly to young people and to the young at heart. This service includes a shorter Gospel reading, a children’s homily message, a favorite song and Communion around the altar. — The 10:15 a.m. service has organ music, our various choirs, including youth and adult bell choirs. 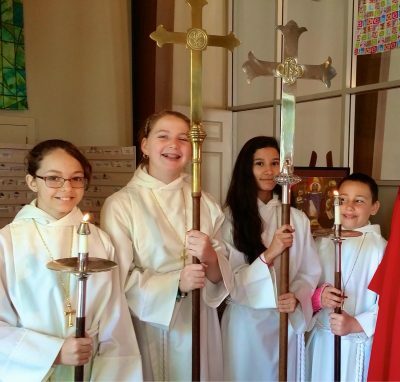 Several times a year we have Youth Sunday, in which youth group members conduct the entire service, including preaching and assisting the priest with the service of Holy Communion. Summer Sundays (through September 3rd) — 9 a.m. — Our summer worship schedule begins the first Sunday in July, with one summer service at 9:00 a.m. That schedule will continue through July and August, returning to two services in September. Wednesdays throughout the year — 10:00 a.m.
During Lent, we offer a Soup and Study series. CENTERING PRAYER and MEDITATION is offered Tuesdays and Thursdays from 8:00 – 8:30 a.m. in the Historic Trinity Chapel.